Ueno park (上野恩賜公園, uenoonshikoen) is located right next to Ueno Station. It is one of popular park in Tokyo Metro. There are many attraction, such as museums, zoo, shrins, for tourists. Shinobazu Pond is another feature of Ueno Park. In April, many people have Hanami party at this park. 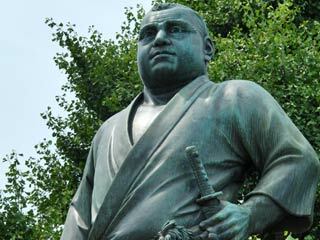 Meet the statue of Saigo Takamori, the hero of Meiji Restration. The real name of Ueno park is Ueno Imperial Gift Park. The park was used to be Kanei-ji Temple which one of Tokugawa Temple to protect Edo castle form unlucky direction. In Boshin War at the end of Edo Period, the temple was destroyed, and reconstructed as a park by Emperor Taisho in 1924. There is Daibutsu, called Ueno Daibutsu in Ueno Park. There are many homeless people.